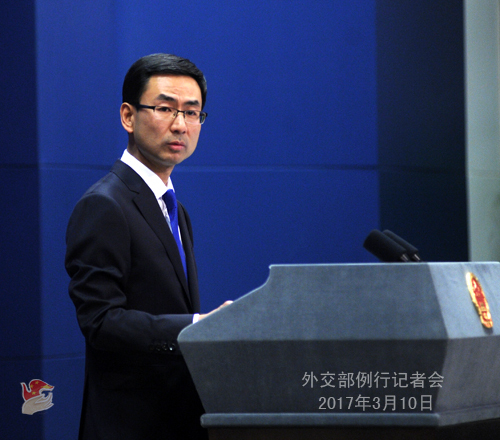 At the invitation of Foreign Minister Wang Yi, Minister of External Relations and International Cooperation Alain Aimé Nyamitwe of the Republic of Burundi will pay an official visit to China from March 13 to 19. This will be his first official visit to China, during which, Foreign Minister Wang Yi will hold talks with him for in-depth discussions on the bilateral relationship as well as international and regional issues of common interest, and sign an agreement on establishing a consultation mechanism between the two foreign ministries. China and Burundi have long been friendly with each other. Over the years, we have grown political mutual trust and achieved fruitful results in cooperation in infrastructure building, health care, education, culture and other fields. It is believed that the visit by Foreign Minister Nyamitwe will further consolidate our traditional friendship, deepen bilateral cooperation, push for bigger progress in the relationship and bring more benefits to the two peoples. Q: The ROK constitutional court upheld the impeachment of President Park Geun-Hye. What is China's comment on that? The Chinese side once expressed dissatisfaction over some of the policies adopted by Park Geun-Hye during her term of office, such as the deployment of THAAD and the signing of a military intelligence sharing agreement with Japan. The ROK is going to elect a new president. What is China's expectation for that? A: We have noted the latest developments. We will not comment on the impeachment as it belongs to the domestic affairs of the ROK. As a neighbor, we hope that the ROK can maintain political stability. Speaking of former President Park Geun-Hye, we said before that during her term of office, she has done a lot to advance the bilateral relationship, and we speak positively about this. And as you just mentioned, it was also during her tenure that the ROK government consented to the deployment of THAAD in the country, which has affected the bilateral relationship and been met with our opposition. As for the issue of THAAD, China's position is fairly clear and firm. It remains unchanged. Q: The Philippine Defense Secretary said that Chinese ships had been spotted in waters near Benham Rise. The Philippine side is highly concerned about that as Benham Rise is UN-recognized territory of the Philippines. Do you have any comment on that? First, in 2012, the UN Commission on the Limits of the Continental Shelf approved the submission made by the Philippines in 2009 in respect of the limits of the continental shelf beyond 200 nautical miles in the Benham Rise region, enabling the Philippines to carry out exploration and development of natural resources in this region. But it does not mean that the Philippines can take it as its own territory. Second, according to international law including UNCLOS, a coastal state's rights over the continental shelf do not affect the legal status of the superjacent waters or of the air space above those waters, nor do they affect foreign ships' navigation freedom in the coastal state's EEZ and on the high seas, or their innocent passage through the coastal state's territorial sea as supported by international law. Third, according to the competent authorities, Chinese vessels for marine research did sail across relevant waters to the northeast of Luzon, the Philippines last year, exercising navigation freedoms and the right to innocent passage only, without conducting any other activities or operations. The remarks by some individuals from the Philippines are not consistent with the facts. Fourth, actually, in response to the Philippines' concerns about activities by Chinese marine research vessels, foreign ministries of the two countries have had a friendly exchange of views last January to sort out the facts and properly address the issue. Fifth, working together, China and the Philippines have properly resolved their differences, added momentum to the development of the bilateral relationship, and driven forward practical cooperation across the board. It serves the common interests of the two countries and peoples, and meets the aspiration shared by peace-loving countries of the region and beyond. It is hoped that individuals of the Philippines will stop playing up the false information and do more to promote mutual trust. Q: According to Pakistani media reports, the Chinese government invited five senior Taliban officials over in February. Can you confirm that? What has been discussed by the two sides? A: I am not aware of that. 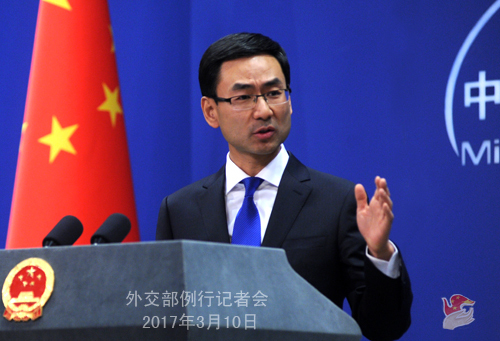 The Chinese side supports the "Afghan-led and Afghan-owned" peace and reconciliation process in Afghanistan, and encourages Afghanistan's national unity government and the Taliban to engage in peace talks at an early date, in a bid to realize national reconciliation and restore peace and stability in Afghanistan as soon as possible. The Chinese side is in contact with all parties related to the Afghan issue, and is ready to continue to play a positive and constructive role. Q: Cruise ships that had been taking Chinese tourists to call at various ports in the ROK will be visiting Japan instead. Is this not an example of China taking discriminatory measures to punish ROK companies because of THAAD? Are these measures intentionally against the ROK? A: I am not aware of the specifics you mentioned. Similar questions keep coming up these days. I prefer not to repeat China' s position on the issue of THAAD, as you are all clear about that. What I want to say is that over the past 25 years since the establishment of diplomatic relations, China and the ROK, as each other's important neighbors, have worked hard and secured visible progress in the bilateral relationship. Nowadays, China is the largest trading partner, the largest source of international students, and the largest destination of outbound investment and trips of the ROK. The ROK has also become one of China's most important partners for trade, investment and cultural exchanges. All these hard-won results are worth cherishing. We are saddened to see that the China-ROK relationship is in difficulty. The crux, as you all know, is that the ROK insists on coordinating with the US in the deployment of THAAD in disregard of China's concerns. We once again ask the ROK to keep in mind the overall interests of the two peoples and bilateral cooperation, take seriously China's concerns, heed the public's appeals, cease the deployment and remove the obstacles for the sound development of China-ROK relations. Q: Philippine Defense Secretary Delfin Lorenzana said yesterday that China dropped its plan for land reclamation on Huangyan Dao only after persuasion by the US. Can you confirm that? What is China's response to that? A: The Chinese side has made its position clear on many occasions. Since the issue was revisited by some individual from the Philippines, I would like to say a few more words. It is China's sovereignty to decide what to do or not to do on Huangyan Dao. Without a doubt, China will properly handle the relevant issue. China-Philippines relations are developing in a sound momentum, with rapid progress in cooperation across the board. Acting on the two leaders' consensus of enhancing good-neighborliness, properly addressing differences, and pursuing common growth, the two countries are strengthening political mutual trust and deepening mutually beneficial cooperation. It is hoped that individuals in the Philippines will stop groundless speculation and make more efforts to promote mutual trust and bilateral relations. Q: The China Secretariat for Lancang-Mekong Cooperation (LMC) was officially set up today. Can you give us more details on that? A successful LMC leaders' meeting was held in Sanya in March last year, setting in motion the LMC mechanism. What progress has been made so far? A: The LMC China Secretariat was officially set up this morning. It has the functions of planning, coordination, implementation and publicity. Its establishment will help mobilize all parties to be more deeply involved in LMC. LMC is a new type of subregional cooperation mechanism planned, built and shared by China and Mekong countries. Having achieved robust progress in institutional building and practical cooperation, it is now in the stage of comprehensive implementation with great vitality and enormous potential for development. Over half of the 45 "early harvest" programs approved by the first leaders' meeting are either being implemented or already implemented. Preparations for the three cooperation centers in water resources, environment and law enforcement and security are making smooth progress, and a lot of other projects and proposals are advancing steadily. Since the LMC special fund was put into use, six countries have filed their applications. Both Laos and China have established LMC secretariats. All these show that LMC is not only in motion but is progressing rapidly. China will work together with Mekong countries to enhance the complementarity of our strategies, deepen practical cooperation, press ahead with LMC, jointly build the LMC corridor, make LMC an important platform for the Belt and Road initiative, contribute more to the development of Mekong countries and their people's wellbeing, and give a boost to the building of the ASEAN community. Q: Foreign Minister Wang Yi reiterated days ago at the press conference the approach of pursuing in parallel tracks denuclearization of the Korean Peninsula and the replacement of the armistice with a peace agreement. He also suggested that the DPRK suspend its missile and nuclear activities in exchange for a halt of the large scale US-ROK exercises. It seems that the US and the ROK are not very positive about that. What is your comment on that? Do you still think that relevant proposals are workable? A: The suspension-for-suspension proposal and the parallel-track approach are two parts of the whole plan. The former aims at easing the tension and creating an opportunity for the restart of dialogue and consultation, while the latter is to advance denuclearization and realize lasting peace and security on the Peninsula and in the region. The Korean Peninsula issue is complex. There is a severe trust deficit among relevant parties. Only a solution that accommodates all parties' concerns can thoroughly and effectively resolve this issue. The suspension-for-suspension proposal and the parallel-track approach put forward by China accommodate various parties' most pressing concerns, reflect the reality of the issue, grasp the crux of the problem and are in line with relevant Security Council resolutions, and are thus impartial, reasonable and workable. We hope that all relevant parties will stay committed to peace, stability and denuclearization of the Korean Peninsula, think out of the box, act in a rational and pragmatic way, think more carefully about China's proposals and make a constructive response. The Chinese side is open to ideas that may lead the Peninsula out of the predicament. If you think your idea is better, just speak it out. We are ready for discussions with all parties and will create conditions for the resumption of peace talks through constructive efforts. Q: Chile's Foreign Minister said that they plan to hold a summit for TPP countries plus China on March 14 and 15. Does China plan to attend the summit and who will the participant be from the Chinese side? A: The Chinese side supports economic integration in the Asia-Pacific, and stands ready to enhance communication and coordination with Chile and other relevant countries to build FTAAP, create an open Asia-Pacific economy and inject new impetus to economic growth in the region and beyond. We hope that the meeting will help realize the goals. To my knowledge, the Chinese side is actively considering attendance at the meeting. Q: Will the impeachment of ROK president have any impact on China's relationship with the ROK, the deployment of THAAD in particular? What is your vision of the relationship? A: I have already answered that question. I will not comment on the impeachment as it belongs to the domestic affairs of the ROK. And we hope that the country can maintain political stability. China's position on the issue of THAAD is clear, firm, and unchanged. With regard to the relationship with the ROK, we are close neighbors that cannot move away from each other. The bilateral relationship has made remarkable progress over the past 25 years since the establishment of diplomatic ties, bringing tangible benefits to the two peoples. 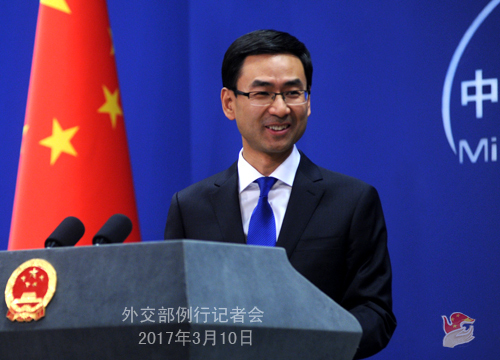 The Chinese side remains positive and open about exchanges and cooperation with the ROK. As I just said, the bilateral relationship is in difficulty, mainly because of THAAD. We hope that the ROK will take seriously our concerns, heed the public's appeals, keep in mind the overall interests of bilateral cooperation as well as regional peace and stability, cease the deployment and clear the way for the development of bilateral relations.